When we went to Mountain High, we first went sledding. When we went sledding, there was a very steep side of the mountain where you can sled. I was getting hot on the mountains where there was snow (because I was running around, climbing steep sides while my brother was throwing snowballs). I decided to take my puffy pink jacket off. After a few minutes, my long-sleeved shirt was soaked. The good thing is that I had a overall pants and snow shoes for warmth. The negative thing is that we had to go to our hotel because it was getting late. In this photo, my brother and I were snowboarding. We started to snowboard last year. My dad never took snowboard lessons, so he just skied. My mom is not in the picture because she was taking the picture. If you look carefully, you will see some snow powder. Guess what! It was snowing! I was so excited because this was the first time seeing real snow fall. In the background, there is the lift. The lift gives you a ride all the way to the top of the mountain. It is fun riding on it, but there is no seat belt. Here, I am snowboarding (again). Since I snowboarded all the way down from the top of the hill, the snowboard picked up a lot of snow. In the background there is the lift again. It looks different because it is in another position. Did you ever see snow falling? Where did you go over winter break? I can tell that you had a fantastic time sledding and snowboarding. 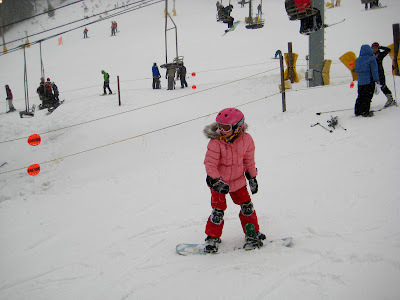 I have never tried snowboarding but I love to ski. Have you ever tried skiing? How did you choose snowboarding over skiing? I have not gone skiing this winter, but your post really makes me want to take a trip to the mountains. I live in Florida, but I grew up in Ohio where we had lots of snow. I never went skiing though, because Ohio does not have big mountains. As a child I did enjoy sledding and ice skating. I don't think snow boarding had been invented yet. That might be interesting to research. When was snow boarding invented, and how long has it been popular? We also made snow ice cream when I was a child. It was simple, but the snow needed to be fresh and powdery (not too wet). All you need to do is collect fresh, powdery snow, and put some vanilla flavoring on it. (I suppose you could use some other flavor, but all we ever tried was vanilla). Maybe you can make some sometime. Anyway, thank you for sharing your experience in this blog. You remind me of my days when I lived where it snowed. Your post got me thinking about exactly Mountain High is, and where it is located - and I think that its not in Califorina, we don't have snow here in New Zealand, only twice ever, and last year (which was the second time) it was for about ten seconds. Some of our students got very excited but it was like basic mush and disaapeared quickly. We have some students that have gone to the moutains to go skiing. I think that Mountain High is probably like that as well. One thing that interested me from your report you said that it was the first time that you've seen snow fall but you've obviously been skiing a bit, so have you been to an artifical snow venue? Have I ever gone snowboarding? It has been some time since I was last in a snow region. Back then I hadn’t heard of snowboards although I think they were invented sometime in the first half of the 1900s. Would I try one? Maybe but I think I’d feel safer on a toboggan. Did I ever see snow falling? I have seen snow falling in Australia a few times, the last time had a major road between Australia’s capital city, Canberra, and my home on the coast. It meant a long detour to get home. A three hour trip became six hours that day. Where did I go over winter break? Mountain High looks like a wonderful place to be! No, I have never gone snowboarding. I have gone skiing, though. 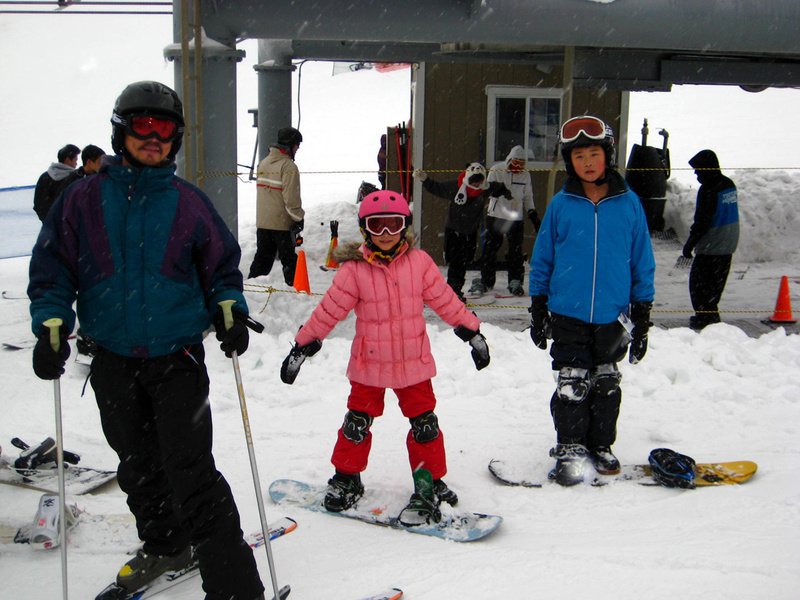 I went skiing in Big Bear with my family. I skied with my Dad and stepmom, while my sister snowboarded with her friend. Skiing was a great experience. Have you ever gone skiing? If so, where did you ski? I do not recall if I ever have seen a snowfall. I have been in the snow, though. I was in the snow in Big Bear, and in a forest. To me, the snow looks like a giant, sparkling pillow. We have been classifying particles in class. There are three different categories. Solid particles, water particles, and gas particles. Can you tell me what kind of particle snow is made out of? 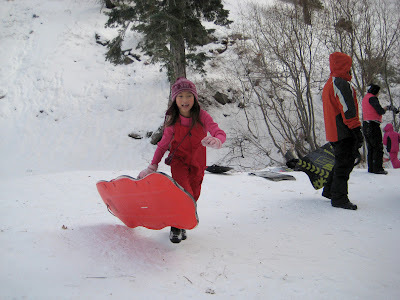 Over winter break in second grade, I went to Big Bear. In Big Bear, I went skiing, played air hockey in the cabin I was staying at, collected giant pinecones, and played in the snow. What else did you do when you were at Mountain High?